This collection of relevant technical papers, covering on a broad range of topics relevant to the design of both passenger and vehicle ferries, and includes papers from the beginnings of SNAME in 1893 to today. Covering historic, practical and theoretical knowledge pertaining to the design of both passenger and vehicle ferries, it is a valuable compilation of technical information on a wide range of topics to increase the knowledge base of naval architects, marine engineers and designers in both operation and design, in the following topic areas: Air Cushion, Damage, Design, Environmental, Ferry Specific, Habitability, Hydrofoil, Maneuvering, Operations, Performance, Propulsion, Safety, Seakeeping, Stability, Structures, SWATH, Systems, Vibration, Waterjet, and Welding. Edited by SNAME members Robert Latorre Chris Barry, John G. Hoyt III and Asher Davidson. This is a comprehensive two-volume set of books devoted to the hydrodynamics of high-performance marine vessels. These vessels may also be generally referred to as high-speed or advanced marine craft. Types of craft addressed include monohulls, catamarans, trimarans and other multihull vessels, air-cushion vehicles, surface-effect ships and planing craft. The hydrodynamic aspects dealt with are the steady-state resistance, wave generation, sinkage and trim, unsteady effects and motions in waves. Separate chapters are devoted to viscous resistance, transom sterns and the behavior of skirts for air-cushion vehicles and seals for surface-effect ships. Effects of the finite depth of the water and the possible lateral restriction on the width of the waterway feature prominently in the books. In each case, the presentation includes a full analytical development of the theory accompanied by a comparison of the theoretical predictions with extensive experimental data. In the two volumes there is a total of 888 full-color Letter-size pages. The text is accompanied by 433 photographs of ships and ship models, 1155 graphs, 1295 equations and 1249 references. The work represents the author's research, consulting and professional experience in both universities and research centers spanning a period of over fifty years. The books are targeted at university-level students and specialized industry engineers in the field of naval architecture and associated areas. This text provides an introductory familiarity with the naval architecture of Advanced Marine Vehicles, with particular emphasis on Catamaran, SES and SWATH types. It is intended as a textbook in advanced marine vehicle design, for a 13-week elective in Naval Architecture at the Senior undergraduate level. As such, it is assumed that the students have a working familiarity with the naval architecture of conventional ships, and thus this work emphasizes the differences between conventional-ship design and AMV-design. The text is focused on early-stage design, providing the tools for preliminary ship sizing in order to evaluate whether the AMV is the appropriate ship type for the mission. It also includes discussion of the particular features and benefits of the major AMV types, so that you can decide when one AMV type might be preferable over another. The book begins with an overview of the types of AMVs. This is followed by discussions of each of the ‘nodes’ of the ship design spiral, e.g. Resistance, Propulsion, Structural Design, Arrangement, Maneuvering, etc. Appropriate to being an overview type of course at the undergraduate level, this book does not provide a detailed treatment of any of the hydrodynamic or mechanical dynamic nuances of high speed vessel design. Instead I present design lanes and overall guidance, such that a practitioner can execute a reasonable early-stage design. Tackling of specific detailed problems that may come up within such a design exercise may require recourse to more detailed texts, and appropriate references and citations are provided herein. This text is the result of the author’s 35 years as a practitioner in the design of advanced marine vehicles. The Guidelines for Marine Forensics Investigations, developed by a variety of maritime experts including engineers, architects, historians, anthropologists, filmmakers, and hydrodynamicists, is intended to be used by professional and amateur investigators in the field of marine forensics investigations. The detailed manual showcases information gleaned from diving and marine forensic analysis conducted on historic shipwrecks including specific examples from the Titanic, Britannic, Edmund Fitzgerald, Lusitania, Andrea Doria, and Bismarck and many others. Written by leading experts in the burgeoning field of marine forensics investigations, authors include Guidelines for Marine Forensics Investigations editor Sean Kery, Senior Hydrodyamicist and Vice Chairman of the Marine Forensics Committee, and world-renowned naval architect William Garzke, Chairman of the Marine Forensics Committee of SNAME and Symposium Chairman. Expert in passenger ship design, Philip Sims, Naval Marine Engineer Principal Leader, CSC and Titanic director and deep sea underwater explorer and inventor of autonomous underwater 3-D cameras, James Cameron also contributed to the development of the guidelines as well as Paul Henri Nargeolet, who has been the chief investigator of the Titanic wreck and developer of techniques in deep ocean exploration. In January 1958, Panel M-15 (Heat Balance) of the Society of Naval Architects and Marine Engineers Technical and Research (T&R) program was formed to investigate the possibility of standardizing the assumptions and allowances and methods of treatment of heat balance calculations. The result of the Panel's work was published in November 1961 as Technical and Research Bulletin No. 3-11, "Recomended Practices for Preparing Marine Steam Power Plant Heat Balances" and found universal acceptance in service. However, the need for additional practices relating to sea trial was soon evidant and the Panel in January 1968 prepared T&R Bulletin No. 3-17, "Recomended Practices for Correcting Steam Power Plant Trial Performances." Changing practices and increasing capability of marine steam power plants necessitated the revision of Bulletin No. 3-11 which was prepared under contract from the Society in 1971 under Panel's guidance. The Proceedings from the 2012 and 2013 Annual Meeting and the 2014 SNAME Maritime Convention (SMC) includes papers from SNAME technical program, Papers and presentations from the years Ship Production Symposium and presentations from T&R Panels from that year. Purchase price includes papers on a USB drive. Papers, Presentations, and Supporting Documents from the symposium sponsored by the Northern California Section. Available only as CD ROM. Papers, Presentations, Transcripts and Supporting Documents from the Symposium. Contributors include Keith Michel, Bruce Russell, Haifeng Wang, Chris Grundler (transcript of keynote), D. Braxton Scherz, Eirik Nyhus, Tore Longza, Jon Rysst, John Larkin, Yoshi Ozaki, Kirsi Tikka, Hugh Harris, Stephen Gumpel, Dr. Pierre C. Sames, Dr. Jasper Faber, Drew Nelson, Bryan Wood-Thomas, Mazyar Zeinali, Michael Gaffney, John Hatley, Daniel Kane, and David Rodger. In this baby coffee table book, SNAME Fellow Rik van Hemmen describes the chronology of boating on the Navesink River. The book is a tour through time of a small river in New Jersey both in pictures and in words, but also provides a vivid picture of how people interact with the water depending on their economic circumstances, their geographical location or their available resources. The book reinforces that naval architecture is deeply woven into a society's structure and that naval architects cannot ignore humanity's connection with the water, just like architects cannot ignore humanity's connection with the land. Naval architecture exists in canoes, aircraft carriers and tankers alike, and while the aircraft carriers may provide the bread and butter, the canoes provide the next generation of naval architects. This text is an introduction to those practical elements of the theories of naval architecture that are most helpful and essential to ship’s officers, marine engineers, shipyard engineers and technicians, who work on seagoing vessels or in the profession that service them. The author explains the concepts of naval architecture in simple language for students in many of the maritime disciplines. Problems and answers are also included. Robert Zubaly is a Professor Emeritus of Naval Architecture in the Department of Engineering at SUNY Maritime College. Ocean Engineering is simply defined as the application of engineering principles to the ocean environment. Ocean engineering is a very challenging field addressing the use of this vast ocean frontier while striving to protect the same ocean environment and marine life. The book “Elements of Ocean Engineering” is intended for use as a first course for ocean engineering and naval architecture students and as an overview for practitioners in ocean engineering and related fields. The topics covered include ocean wave mechanics, offshore and coastal applications, floating systems, underwater systems, ocean engineering materials, instrumentation, underwater acoustics, dredging, laboratory modeling, environment and safety, and ocean engineering design. Robert Randall is Professor of Ocean Engineering in the Civil Engineering Department of Texas A&M University. This CD contains 266 papers encompassing almost every aspect of marine environmental protection and environmental engineering. Twelve contributing members of the joint Committee on Environmental Engineering, under the direction of chairman Cdr. Stephen P. Markle, P.E., undertook a review of ASNE and SNAME associated publications since 1984, and selected those that in their judgment and experience would be most helpful in their professional endeavors. The intent was to provide both historical perspective as well as cutting edge technology and processes in use today. Bearing in mind the complexities of Energy Efficiency Design Index applicable to new ships, the book covers a detailed description of the same and various techno commercial implications. Industry must get to grips with the complexities of the EEDI and its application and need to do it quickly, or risk incurring additional costs that could persist many years into the future along with life of ships. It is essential to ensure achievement of optimal designs to meet the EEDI requirement taking into account evolving commercial and economic factors. 171 pages ♦ Hard Cover ♦ 3 lbs. The author discusses in detail the fundamentals and recent advances in fatigue analysis, with special emphasis on crack mechanics and fatigue design of structural details. This title is intended for engineers, research staff, professors and graduates engaged in fatigue-preventing design and survey, fatigue studies of materials and structures, planning repair and maintenance, and strength standard development. This book presents the small boat designer and builder with a basic insight into the nature of fiberglass as a boatbuilding material, as well as a sound, yet simple, approach to analyzing fiberglass boat hull structures. A thorough review is given to the characteristics of fiberglass materials and laminate design properties. In addition, valuable data is presented on basic design principles such as selection of structural loads, safety factors, deflection and vibration limitation. The level of detail engineering analysis of fiberglass structures, tempered with a practical, uncomplicated approach. The book is well illustrated and includes numerous step-by-step design examples. This handbook has the tools needed to meet the exacting acoustic standards that modern design, building, and operation of merchant ships, naval surface ships, and submarines require. Ship acoustics are discussed from the basic concepts to the sophisticated interaction of sound treatment with ship’s structure. Descriptions are provided of interaction with hull arrays, beamforming, flow noise, transmission, and other phenomena. This handbook is useful as a primer for understanding the subject and as a sophisticated reference for acoustic design and problem solving. In 1943 the Society published a volume documenting the developments in maritime technology during the Society's first 50 years. This volume, created on the occasion of the Society's centennial celebration, covers the succeeding half century. Introduction to Naval Architecture was written in the early 1980s as an introductory text for any naval architecture/marine engineering student, but especially for Naval Academy midshipmen learning about naval ship design. It includes overviews of ship geometry and hydrostatics, properties of shipbuilding materials (circa 1980s), strength and structure of ships, initial, overall and damaged stability, resistance, propulsion, ship motions in a seaway, ship maneuvering, and submarine hydrostatics. The text includes many example problems worked through step by step and includes a related set of homework problems. If you're studying or working in the field of naval architecture, this book is a useful addition to your reference library. This timeless book serves as an introduction to naval architecture for those who have limited knowledge of the subject. Eric Tupper, former head of structures research and chief engineer with the Admiralty Research Establishment, derived this revision from the original landmark book, Muckle’s Naval Architecture. This introductory textbook for students of marine engineering is intended for use in the classroom and on the floor plates. It was prepared by professors at Webb Institute, the US Merchant Marine Academy, and the University of Delaware. The two-volume format was selected to allow students to examine the illustrations while reading the text. This Book has been assembled to provide the salvage engineer an authoritative reference work comparable to the standard reference works available for other technical disciplines. Most of the subject matter presented is not new, but has been gleaned from many different sources. Salvage engineering is by its nature interdisciplinary, innovative, and improvisational; it is quite impossible to include in a single volume through treatment of all fields encompassed by profession. This handbook should be taken as an outline of an extremely broad and diverse subject. Many of the component subjects are extensively treated in available literature and the aspiring salvage engineer should expect to gain a complete knowledge of the profession only by reference to works on related topics, extensive study of salvage histories, and time on the proving ground experience. This edition of Marine Engineering presents more than twenty years of evolutionary changes in the maritime industry. The book provides a complete review of marine engineering, encompassing both naval and merchant practices and incorporating the broad range of technological developments that evolved during the last decades. Also included is material presenting the principles associated with pollution control, design for production, integrated logistic support and noise control, as well as expanded coverage of propulsion shafting and piping. Long-time SNAME member Roy L. Harrington, now retired from Newport News Shipbuilding, edited this landmark volume. This release is first of 3 chapters in the electrical area of the next Marine Engineering revision. 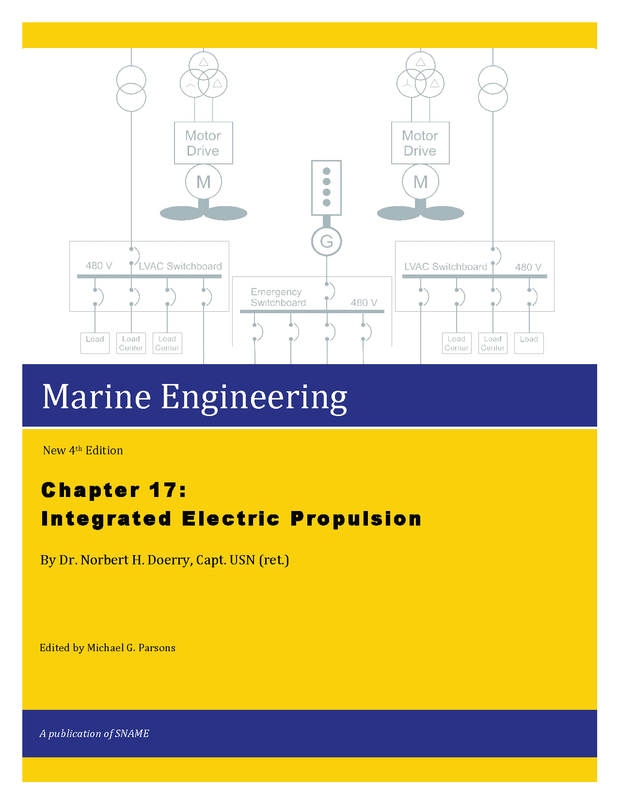 Chapter 17 covers modern electric propulsion systems - MVAC, MVDC, and low-voltage - and their applications for small to large vessels. This book by Professor Neil Bose is an excellent interpretation of the hydrodynamics of the prediction of ship powering performance of various types of ship propulsors. It is based on extensive studies carried out by Professor Bose and his students over the last several years at the Memorial University of Newfoundland, Canada, and his long association with the Institute for Ocean Technology (IOT), National Research Council of Canada. As a result of his International Towing Tank Conference (ITTC) technical committee membership, he has captured the accepted international state-of-the-art of ship powering prediction. Professor Bose has extensively discussed most types of ship propulsors, including oscillating foils and wind-assisted propulsion devices. He has included a general discussion of ship resistance and the prediction of powering performance from model tests, primarily for conventional screw propellers. He has included the problems of screw propellers operating in ice, particularly with regard to strength. He has incorporated extensive lists of references and has included examples to be worked by the reader. As such, the book should be particularly useful to students and those responsible for making powering predictions, especially to those getting started in the field. Former Executive Director of the Society of Naval Architects and Marine Engineers. By providing an understanding of the basic concepts of naval architecture, this book is the perfect companion for the maritime professional who is not a naval architect, but needs to be able to communicate effectively with naval architects. Written in engaging and easily understood terms, this book concentrates on two aspects of naval architecture: design and analysis. Technical discussions are almost entirely qualitative rather than quantitative and coverage focuses on conventional ship worthiness, structural integrity, powering requirements and functional capability. Harry Benford is Professor Emeritus and former Chairman of the Department of Naval Architecture at the University of Michigan. This book presents a comprehensive and up-to-date treatment of propeller analysis and design, including beginning with an introduction to various types of marine propulsion machinery, definitions of powers and efficiencies, and two- and three-dimensional airfoil theory. A section on three-dimensional hydrofoil theory introduces wake vortex sheets and three-dimensional vortex lines. These discussions topics are followed by linear lifting line- and lifting surface theory with both exact and approximate solution methods—including properties of helicoidal vortex sheets, optimum and arbitrary circulation distributions, and the Lerbs induction factor method. There are sections on model testing of propellers, propeller strength and followed by selection and design using both standard series charts and by circulation theory. The final section discusses ship standardization trials, their purpose, measurement methods and instruments, concluding with the analysis of trial data and derivation of the model-ship correlation allowance. The Principles of Naval Architecture series is the defining reference work and text for naval architecture. This volume contains a completely new presentation of the subject of ship resistance embodying these developments. A major goal in the design of virtually all vessels is to obtain a hull form having low resistance. In achieving this goal, the accurate prediction of resistance for a given hull geometry is essential. Since the publication of the previous edition of PNA important advances have been made in theoretical and computational fluid dynamics accompanied by increased use of such work in ship and offshore structure design. The first section of the book provides basic understanding of the flow phenomena that underlie the resistance encountered by a ship moving in water. The second section contains an introduction to the methods by which that knowledge is applied to the prediction of resistance, including model testing, empirical methods and computational methods. A final section provides guidance to the naval architect in designing a hull form. Design procedures are described for achieving favorable flow and resistance characteristics of the hull and appendages. Examples are given for ships designed for high, medium and low speeds. Design considerations affecting both wave and viscous effects are included. Finally the flow in the stern wake is discussed, an area important for both resistance and propeller performance. This new revised volume on Strength of Ships and Ocean Structures addresses several topics of ship strength in greater depth than in the previous edition of PNA, bringing much of the material up to date and introducing some new subjects. There is extensive coverage of the latest developments in dynamic sea load predictions, including nonlinear load effects, slamming and impact plus new sections on the mechanics of collisions and grounding. The incorporation of the various loadings in structural design and analysis is covered including long term extreme and cumulative fatigue effects. There is a more extensive treatment of strength analysis using finite element methods than was included in the previous edition. Ultimate strength evaluation of the hull girder and components is covered and there is a section on structural safety assessment applying reliability concepts including fatigue effects. Particular attention is given to problems encountered in ships of special type and size that have been developed in recent years, many of which, by reason of size, configuration or lack of a history of design experience, require a design approach based on first principles. Modern developments in classification society strength standards and modern rule developments are covered including Common Structural Rules for tankers and bulk carriers. The concluding sections discuss materials other than steel, including composites and aluminum, and vessels of unusual geometry and performance such as multihulls, hydrofoils, and SWATH craft. Principles of Naval Architecture series is the defining reference work and text for naval architecture. This volume presents the principles underlying analysis of the vibration characteristics of modern seagoing ships and the application of those principles in design and problem solving. The classical continuous beam model with steady state response to periodic excitation is presented first. This includes natural frequencies, mode shapes and modal expansion. Discrete analysis is next presented based upon finite element principles. Examples are discussed involving analysis of the entire ship and component parts, e.g., the deckhouse. There are sections on vibration surveys, sea trials, acceptable vibration standards and criteria. Concluding sections treat methods of remediation of vibration problems that are found after the ship is completed, including modifications to propeller design, structure and machinery. This book encapsulates Dr. Bercha’s unique expertise gained throughout his professional career, which spans over 40 years. The book will benefit anyone working in the field of risk analysis, including engineers, architects, lawyers, managers, land use planners, and operators. Part 1 lays out a detailed methodology for solving acute risk analysis problems. Part 2 presents practical applications for this methodology to industrial, transportation, and human performance situations. ISBN: 978-0-9865904-0-5 ♦ Hardcover ♦ 5 lbs. The new two-volume edition is a worthy successor to the highly respected previous editions, and covers all practical aspects of design and construction of ships of all types. The material is all new and up to date, with 55 chapters by authors of international repute. Newcomers and those familiar with the previous editions alike will be pleased with the breadth and depth of the content. This book is far more than a textbook for students: it is a professional reference without parallel for designers, builders, owners, and operators that is virtually a whole professional library in two volumes. In 1982 the leaders of the national Shipbuilding Research Program (NSRP) recognized the need for greater focus on shipbuilding education; the result was the establishment of an education panel (SP-9) within the Society of Naval Architects and Marine Engineers Ship Production Committee-the implementation arm of the NSRP. The first project authorized by the panel was a textbook on advanced concepts of ship production. This edition was revised in 1995 to update the contents to be consistent with technological advances made since the book’s publication in 1988. The focus of this book is state-of-the-art technology and its application to the principals and practices of shipbuilding employing group technology. The authors present a system aimed at optimizing productivity in shipbuilding under current technological conditions. Also included are chapters devoted to basic manufacturing and construction processes and the design for production and CAD/CAM applications. The book is suitable for the upperclass undergraduate and graduate courses, as well as serving as a valuable resource for practicing shipbuilding professionals. Chapte one contains history of shipbuilding and statistics relating to production and market share. Chapter two has been expanded to more directly incorporate material relating to shipbuilding economic theory. Chapter four contains new material, which relates to the fabrication process. New material has been added to Chapter five to more accurately reflect the conditions of current ship production facilities. Chapter six (Ship Design and Engineering), Chapter seven (Planning, Scheduling and Production Control), and Chapter eight (Accuracy Control) have all been updated to reflect the impact of computers on these important areas. Chapter nine (Ship Conversion, Overhaul, and Repair) has been totally rewritten to reflect the experiences of a major consulting firm that has extensively supported shipyards in improvement of their conversion and repair operations. Thorough, clear and informative, Ship Structural Design focuses on the most complex aspects of ship structural design — preliminary design. While concept and detail design are concerned with overall requirements and standard formats, it is in preliminary design — the sizing of all of the ship’s principal structural members — that the structural designer has the largest number of significant decisions and options, and the greatest scope for the optimizing the design. The text uses a rationally-based design approach (design from first principles), which is ideally suited to preliminary structural design. One of the advantages of this approach is that, unlike all earlier design methods, it applies to all types of ships. Moreover, this approach allows the designer to achieve an optimum structure, according to his own particular measure of merit, such as least life-cycle cost, least weight, or any combination of these. As in the original book, the underlying theory has been verified through extensive testing and implemented in MAESTRO, a leading ship structural design program. Written on the occasion of SNAME's Centennial celebration William du Barry Thomas tracks the history of SNAME with advancements in maritime technology from the Society's inception in 1893 to the title year of 1994. A rich journey for any maritime enthusiast and a delight for any SNAME member. This book deals with the many modern approaches to analyze ship dynamic stability and capsizing. The emphasis is on probabilistic assessment of ship dynamic stability. However, in order to evaluate ship dynamic stability and capsizing one must first formulate the nonlinear ship dynamics problem. This book will do much to raise the level of understanding of ship dynamic stability research to that of hydrodynamics and structures, and paves the way to consideration of ship stability safety as one aspect of the up-and-coming discipline of nonlinear dynamics of ships. A comprehensive and cohesive work on the major elements of manned submersible design; useful to those concerned with the design, construction, operation and/ or certification/ classification of these underwater vehicles as well as those involved in the planning or management of ocean systems utilizing them. The editor, Eugene Allmendinger, is Professor Emeritus of Naval Architecture at the University of New Hampshire. The papers on the CD touch on the many different areas these new regulations impact, from emission control of ships operating in international waters, to environmental impacts in the shipyard. This collection represents over thirty years of technical information from various SNAME venues and contains both practical and theoretical knowledge pertaining to energy efficiency, sustainable design and environmental impact in marine design. It is a valuable compilation of technical information on a wide range of topics to increase the knowledge base of marine engineers and designers in both operation and design, addressing marine environmental and sustainability concerns that have become an increasingly crucial aspect to operating in today’s maritime industry. This important volume has been published annually since 1893. It includes reports given at the Society’s Annual Meeting as well as the papers presented at the meeting. Discussions of the papers and closures developed by the authors are included. consider a career in the world of underwater robotics. This textbook is written for college and university entry-level courses and for advanced high school classes. Each chapter begins with a true scenario that sets the stage for the ocean science, physics, math, electronics, and engineering concepts that follow. The final chapter features step-by-step plans for building a basic shallow-diving ROV. There’s also a “What’s Next?” section that provides ideas for modifications and more complex underwater projects. The 770-page text is enhanced by hundreds of photos, illustrations, and diagrams. In addition, the textbook includes a discussion of subsea vehicle development, resource appendices, an extensive glossary, and a complete index.